The first time I understood the land itself could be a place of power was when reading Susan Cooper’s Over Sea Under Stone. Ley lines (pathways to and from geographic or historic structures) provided points where people of magic could travel through time and correct elemental balances. Bruce Chatwin explored this notion in The Songlines, a book about the network of power across Australia as utilised by different Aboriginal nations. Patricia Wrightson believed the land was the heart of Australia. She wanted to bring Aboriginal philosophy to white settlers as exemplified in her wonderful books, The Song of Wirrun. Many years ago I was fortunate to visit the Dharug National Park, near Sydney in Australia, to see the great rock whereupon ancient carvings depict a variety of creatures and symbols. As I watched my guide pour water into the channels to make them more visible, I imagined a great market place, bustling and full of invisible vigour. With no clear theory of their purpose, the carvings might have been signs of each product for barter or symbols of each tribe or hold ceremonial significance. But most certainly that smooth rock was some kind of meeting place, a place of transactions and a definite place of power. American Gods, by the ubiquitous Neil Gaiman, resulted from his year-long road trip across the States. As he travelled he realised that certain road-side attractions were based on places of power. These were the locations where his homeless gods, brought by settlers from Europe and Africa, found their source of energy. 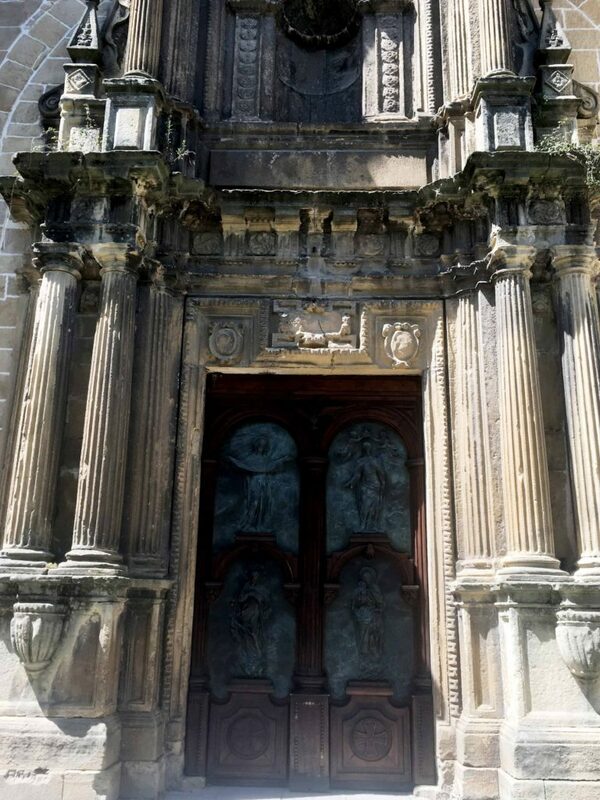 I thought of places of power often as I followed the ancient pilgrim’s route across the North of Spain, El Camino del Norte. but it was not until Oviedo Cathedral that the concept of powerful places really began to crystallise in my mind. 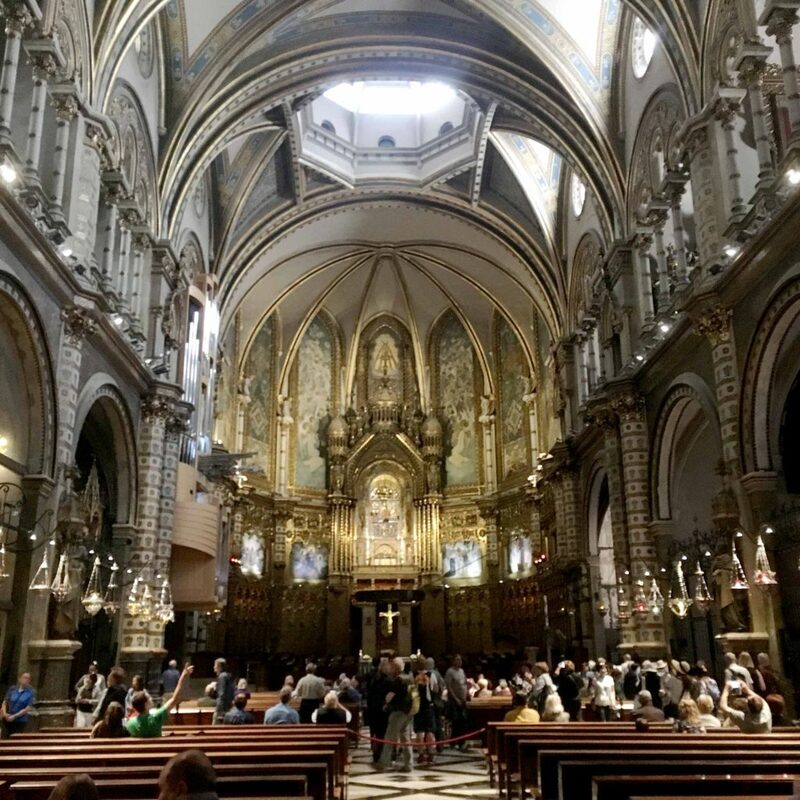 With its wealth of extraordinary relics, Oviedo, a kind of religious Disneyland, is the start of the Primitivo, the first Camino de Santiago. 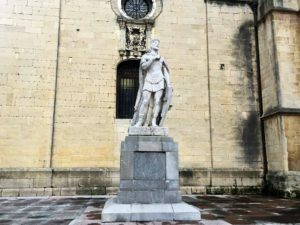 Alfonso II of Asturias, the Chaste, the first official pilgrim immortalised outside Oviedo Cathedral. Check those walking legs! 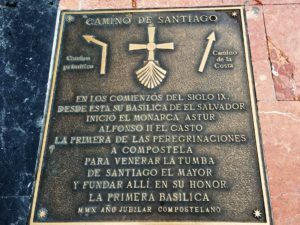 The camino itself was designed as a kind of border patrol system by Alfonso the Chaste, who wanted to keep Moors down south – out of the pure and Christian North. Which way to protect the border of Christianity, Pilgrim? 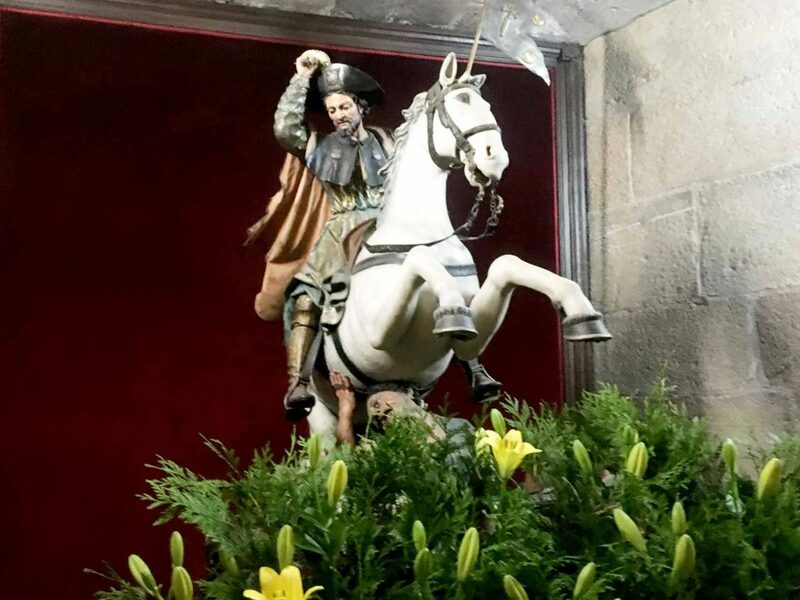 As we walked from Oviedo to Lugo, images of Saint James (Santiago) feature in most churches – the saint flying through the air on a gleaming steed, brandishing a sword and killing Moors left, right and centre. Luckily, your average modern pilgrim in breathable clothing just wants to think about peace and personal salvation and is probably humming ‘Imagine’ by John Lennon as they march along. 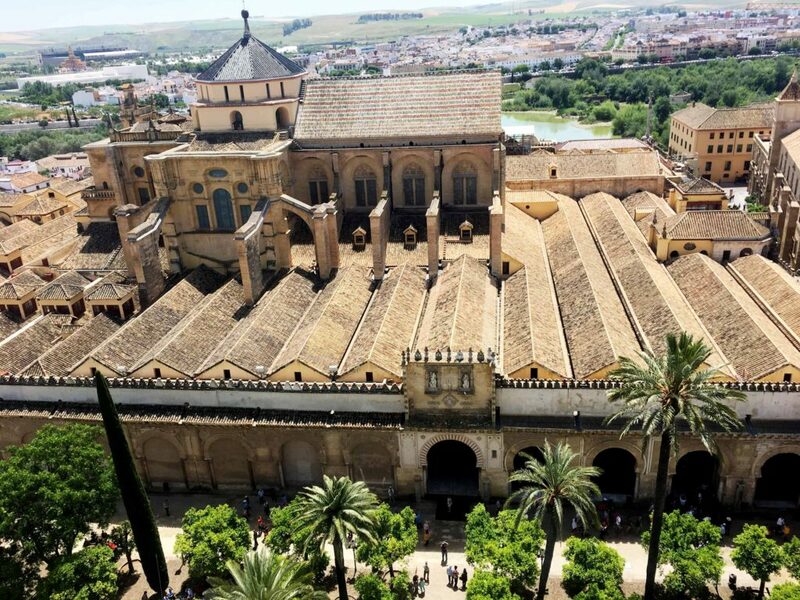 But these Cathedrals were most certainly built on places of power as are many monuments in Spain: the Cathedral in Santiago, the Alhambra in Granada and the Mesquita in Cordoba. 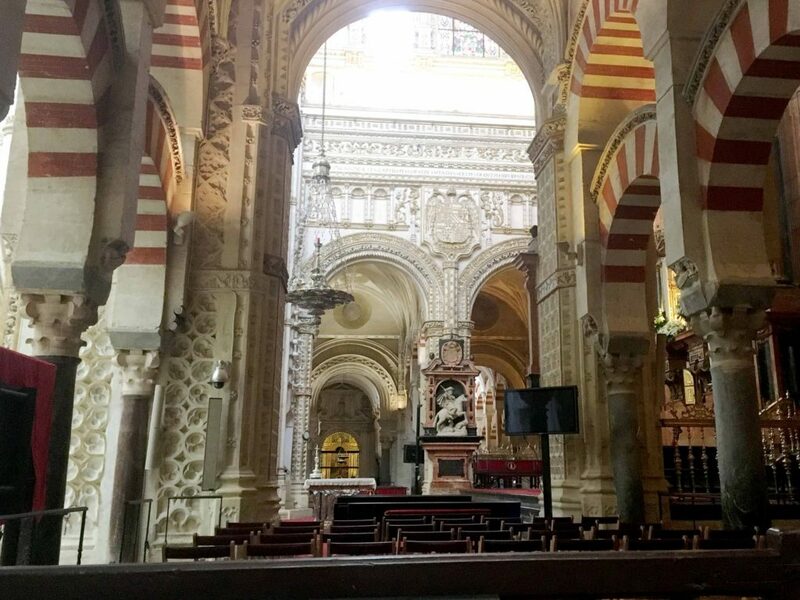 The Mesquita (with Cathedral insert) exists now as a mash up of religious history but surely the site itself was a place of power to start with? Perhaps Neanderthals held parties there? 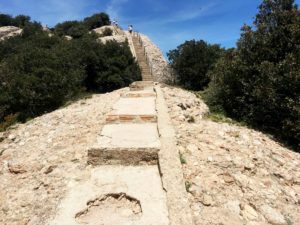 History tells us it was known as a Christian Visigoth temple and when Muslims invaded in 711, a mosque was built to share the site, allowing Christian and Muslims to worship side by side. In 784 the Christian side was demolished and a new mosque built on the site. 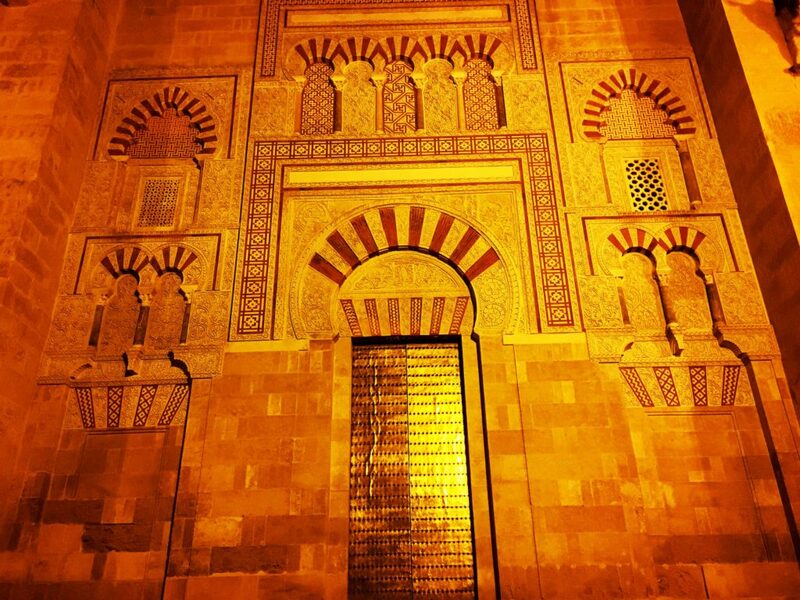 Further additions created the second biggest mosque in the world after Mecca. There’s a handy guide available here. 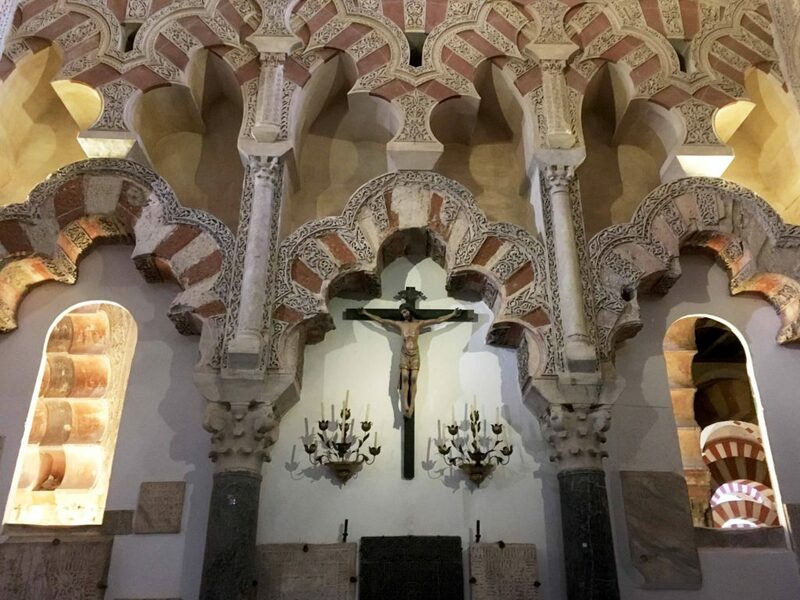 In the thirteenth century Cordoba returned to Christianity but it was not until the sixteenth century that the Cathedral was inserted into the middle of the mosque. 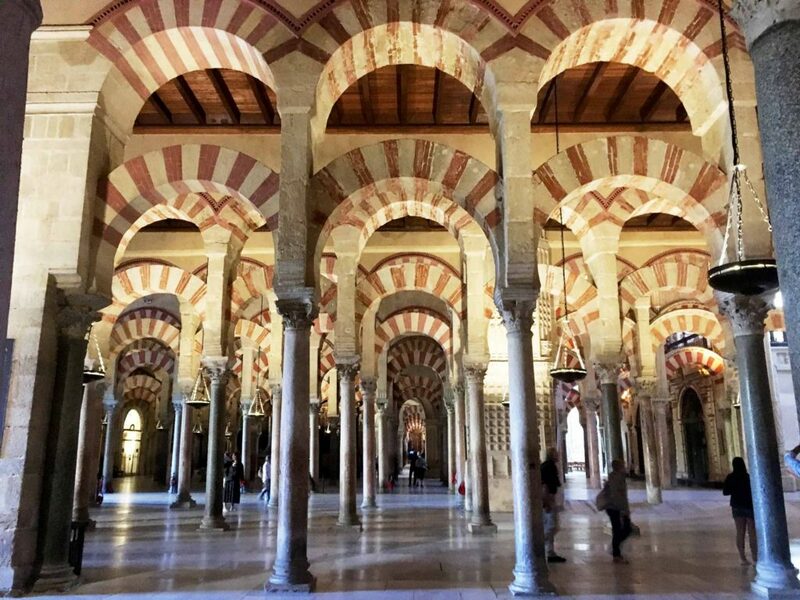 I suppose we should be grateful they didn’t bowl the mosque, as they did with fourteen other religious meeting places in Cordoba that were once mosques but the Mesquita was huge and probably prohibited its own destruction by its sheer force of existence. From outside this block seems to dominate the area by the river. All roads lead to it, tourists are going and coming, and the surrounding merchants have set their nets accordingly. It is imposing with high straight walls and golden doors. But from the inside? Overwhelming. As soon as I entered the Mesquita I wept. For over a thousand years people have come to this place to draw strength. Now, it is a Christian Cathedral but surely Muslims should be allowed to pray here too? Why not revert back to sharing? 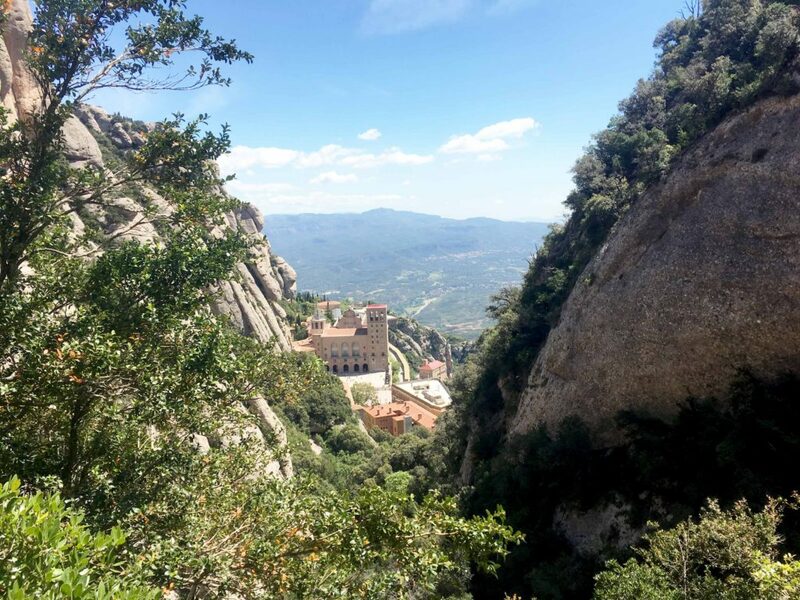 Recently, visiting the monastery in Monserrat, another obvious place of power, I became intensely aware of sounds. 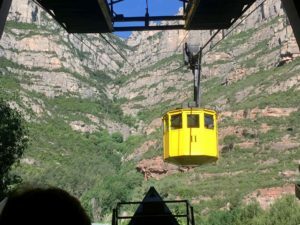 The dog barking, the birds swinging across the sky and muffled chatter as we waited in line for the funicular, while the great stones of the mountain loomed over us. Yellow belljar to take us up the hill – fun fair ride to the big attraction! Waiting to travel, the cheery tourists took selfies, and the high tensile gnawing slowed to an intermittent grind as the yellow belljar aproached and docked, clunk, into the infrastructure. The noise of the cables muffled as we clustered together inside our tank, travelled over deep crevices in the land and people tried to record distant geology in their phones or ipads. In the information centre, sounds of the instructional video describe the origins of the monastery in 888 and the Napoleonic destruction in 1811. What compelled soldiers to climb the mountain? What were they looking for as they looted the monastery and printing press? What did they carry away in glee? 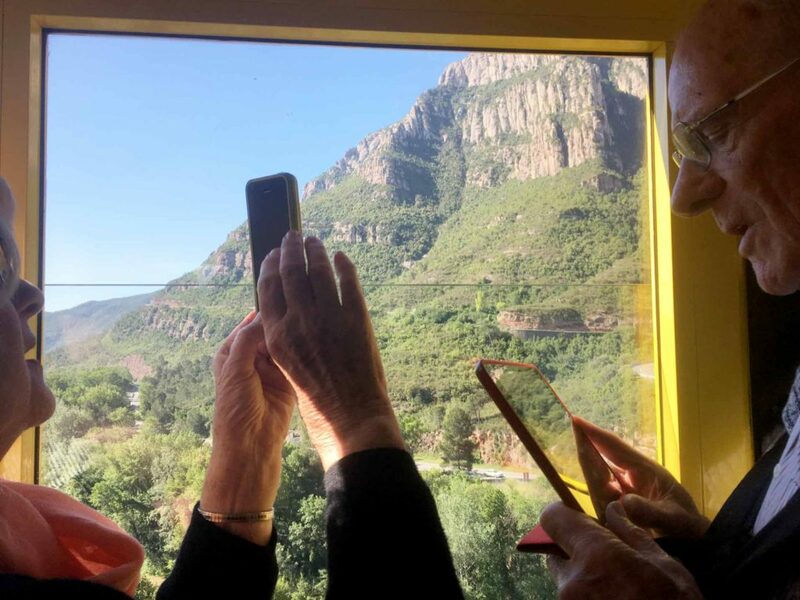 Taking photos and memories away from the Basilica, Montserrat. La Moreneta, the Patroness of Catalonia, is up and centre in the altar piece. Off to the right is a queue of people who will touch the sculpture. Eventually. There were strange noises in the basilica, a distant roaring noise as if we were on a boat, and the tolling bells at 10:45 bringing the congregation into the church for 11am mass. The lights snapped on just as the crowd was exhorted to put away their cameras by quiet attendants. The orderly parade of monks entered, the first voice; clear, Catalan and commanding. The other monks more hesitant, following, elderly men, one trying unsuccessfully to cover his yawns (half dozen or so younger fellows around forty) most with thin white hair and bent backs. The sounds of the organ rose, quiet but welling music – with a wide roaring of wind supporting the tones – not unpleasant but there. The individuals near me shaking hands, turning to greet their friends and neighbours, and hesitantly, me, saying Pau – peace, I supposed – and immediately caught into their own need to receive communion. 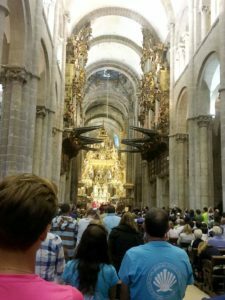 Afterwards the eager pilgrims who rose up the stairs and arrived behind the altarpiece to touch the orb of the Black Virgin (another false idol like that adored statue of Santiago) who draws thousands to worship and adulate. They touch the globe of the universe. Tenderly. The rest of the statue is behind plastic. They exit through a tunnel where people push hard, eager to buy a coloured candle, three euros for a big yellow, red or green tube to place in a line under a ledge of rock darkened by ages of wax smoke. 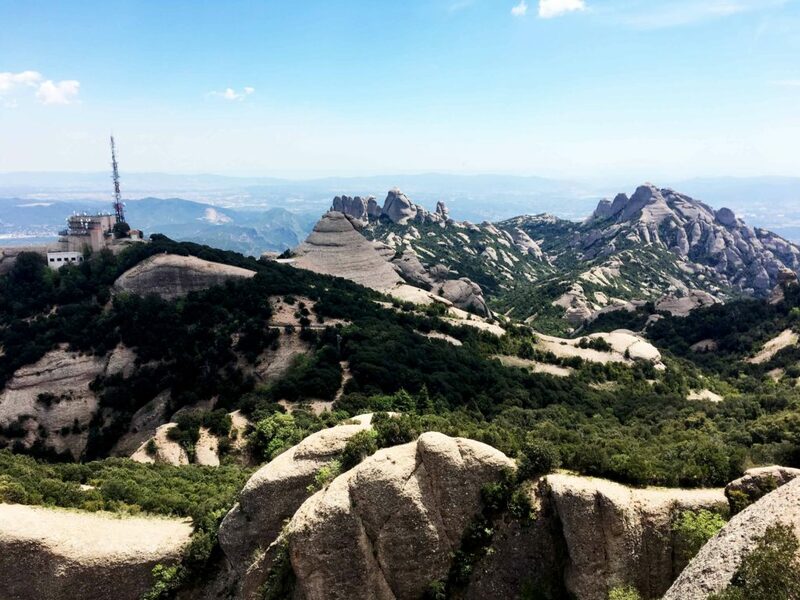 The smell of dead bees and the warmth of the many flames urged me out and up to climb the mountain itself, seek the highest peak of Sant Jeroni, the clear air and whoops. Why, I even heard coo-ees as I reached the sunlit summit. How many people had climbed these concrete steps up the conglomerate stone lumps, like those sand castles that children dribble with wet sand as they play on the beach? How many Napoleonic soldiers took their sandwiches and lay under a wind tortured shrub to avoid the sun as they admired the view to the coast and down to the city of Barcelona? 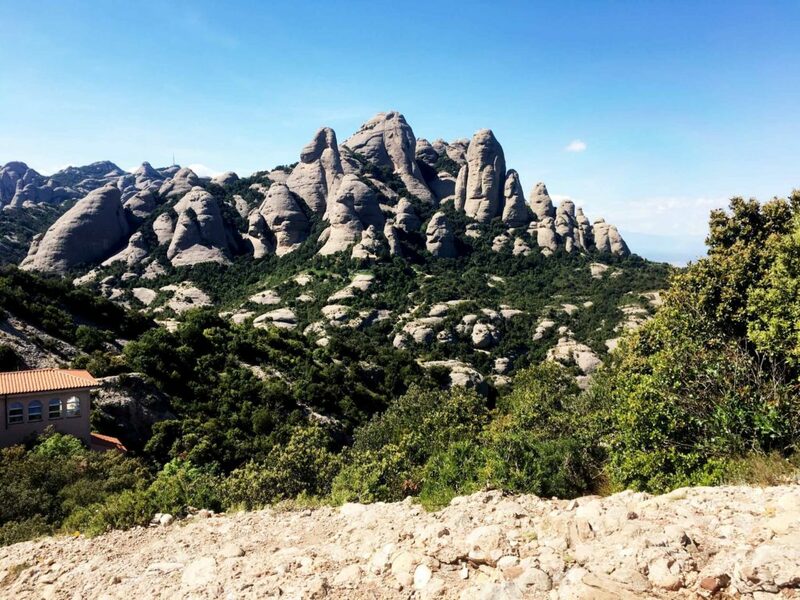 Distinctive shapes of the conglomerate rock shapes of Montserrat – a massif that stretches for over 25 km. The opening of the film Rabbit Proof Fence features aerial footage of the earth seeming, for all the world, to show the skin of the country as the surface of a breathing living being. The outcrops of rocks and sediments that make up Montserrat seem like a wart or growth on top of a natural force. Of course people would build shrines and contemplative structures here. It is a human urge to find a place of power to connect with each other, to communicate and seek strength, together. Donald Trump is currently visiting the great centres of religion in the world. Right now he is in Saudi Arabia, the place of Mecca, the home of Islam. Next stop, Jerusalem, the home of Judaism, and finally, he will go to the Vatican, home of Catholicism, proving all roads do indeed lead to Rome. How deliberate is this journey to the great triumvirate of places of power? Is there something compassionate about the current President of the USA’s pilgrimage? Can we hope for communion, understanding and benevolence for fellow human beings? Dare we hope for peace? What do we think when we observe the enormous arms deal he takes with him? As described in Troy Kennedy-Martin’s 1985 tv drama, The Edge of Darkness, I recall Gaia’s black flowers that will grow to heal the world and feel that all we can do is hope. Or perhaps there is more to do; may I humbly suggest finding your own place of power? Perhaps climb a mountain or find a ley line or some ancient place of religion and pray to your God/energy/force of choice? At least commune with like-minded people and gather strength from the earth. For, by God, it appears we’re going to need it.